Sightseeing with young children in the heat of summer can be exhausting to say the least. I’ve been there! It’s very easy just to give in and spend your days on beaches and in playparks. But if you, like us, really enjoy exploring new places and experiencing the culture then you will want more than this. Experience has shown us that exploring the towns and hilltop villages during the heat of the day is actually preferable to staying down by the lake or attending one of the pleasure parks or playgrounds! Places like Castel Rigone, Spello, Spoleto, Panicale, Corciano and many more charming hamlets are set on hilltops and cooler than the lakeside towns. They also offer welcome shade. The short video below will give you a general impression of the area. This page and the playlist of the same name on my channel link with the Free I SPY TRASIMENO booklet to be found in Information Centres and some bars and hotels around Lake Trasimeno. The booklet takes children on a Treasure Trail around San Feliciano,Castel Rigone, Castiglione, Passignano, Isola Maggiore and Isola Polvese. It contains photographs of places and objects for them to ‘spot’ and focuses on improving their observational skills and making visits really fun. I’ve used my toys, the ‘JUMBLES’ in the various locations and it is quite possible you will spot some of them on your way round! The booklet links with a Playlist of the same name on my Channel which contains videos about the places featuring the ‘Jumbles’ toys. Below is a link to the Playlist I SPY TRASIMENO on my Channel. Scroll down for information aboutthe locations and slideshows. To me as a teenager, Castiglione del Lago WAS Italy! We camped at Lido Trasimeno on the weekend of the Ferragosto and I fell in love with the lake, the countryside, the sunshine, the food, the traditions and the wonderful people. It was my first time abroad and so very exciting. My father was stationed in Naples, Rome and Castiglione del Lago during the last war and that year, 1966, was the first time we had been able to afford the trip. We lived in Lancashire in the North West of England and to plan our route simply drew a line from Dover to Rome passing through France and Switzerland then drove fairly solidly for four days erecting our frame tent each night and storing it away each morning. There were no motorways or even remotely straight roads. Even less frequent were the toilets! Rising majestically above Lake Trasimeno, the historical centre of Castiglione is visible for miles around. Interestingly the hill on which it sits was once an island within the lake. This old centre hasn’t really changed much since that first summer. There are more local produce shops and restaurants and more bars with outside seating but the streets have retained their traditional charm and appeal especially during balmy summer evenings. As a family we loved to stroll around the pretty streets bathed in gold first from unforgettable sunsets and later from the ornate lamps which adorn many of the walls. It is a magical. There are many churches, a museum, the ‘Palazzo della Corgna’ and a magnificent fortress, the ‘Rocca del Leone’ which is a must if you are travelling with children. They will love it and so will you! I’ve visited more times than I can remember but I still enjoy the experience and the views over the lake and town are amazing as you will see from the video below. The actual building is incredible consisting of four towers, a triangular keep and a wall with battlements. For centuries this building, on the shores of Lago Trasimeno was the most important military settlement. It is a delight for children with towers to climb, nooks and crannies to explore and a wall with amazing views, to walk around. In the centre of the Rocca is a large amphitheatre and an open air bar set amongst ancient olive trees. To be in the audience for one of the productions here is an experience neither you or the children will forget. The productions begin usually at dusk when the air is heavy with the scent of lavender and figs and Rosemary and the chirping of cicadas. The setting is so atmospheric that it’s difficult to remember that this is the 21st Century. Take cushions to sit on as the stone steps get a little hard after an hour of so! 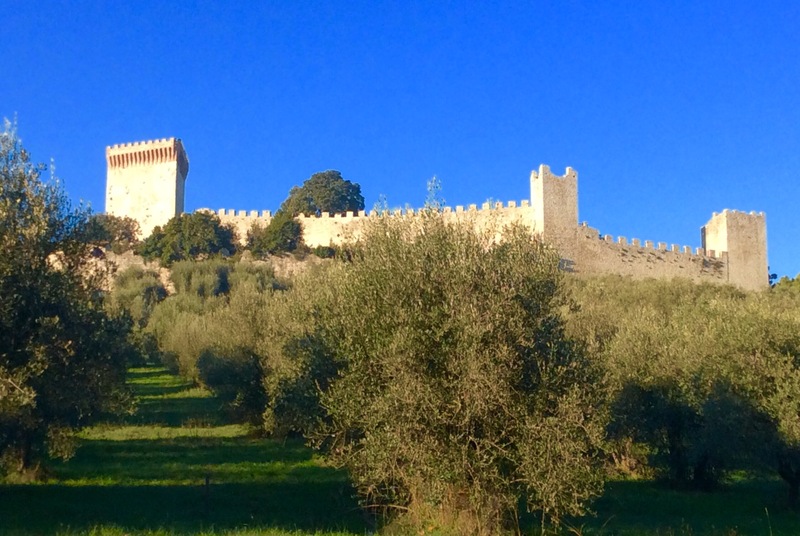 Missed by most is a lovely walk around the outside of the Rocca which leads through beautiful olive groves. This is a good place to picnic or just sit in the shade looking at the lake below shimmering in the sunlight. The best way is to walk down from the parking area outside the Palazzo della Corgna through the little archway and turn left past the delightful Bar il Castello with its lovely garden. Five minutes takes one past the rear of the hospital and into the olive groves with the lake to your right. 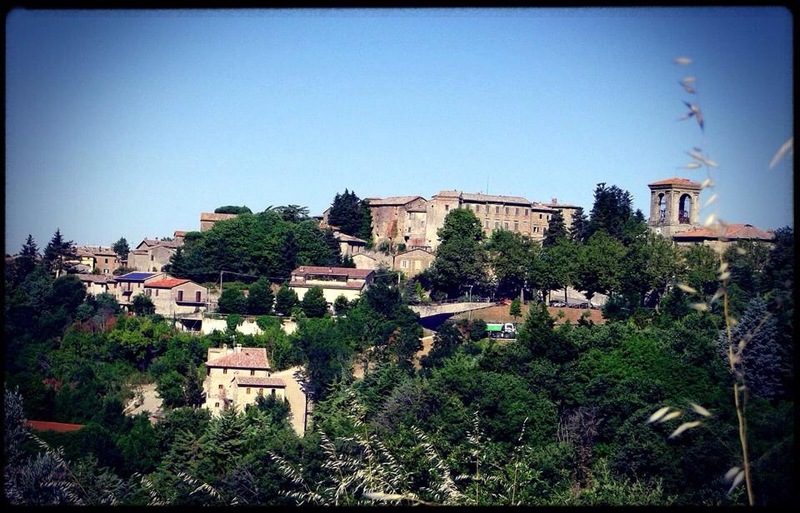 Castiglione is a very big town and there is much more to enjoy in addition to the historical centre. Reached by steps from the rear of the hospital is the road along Lago Trasimeno with bars and plenty of open spaces to play and beaches to bathe. If you prefer you can drive down to this road. There are lots of parking spots along the lake plus a large car park at the end nearest to the Rocca. My recommendations if you only have one day here? After the market the Rocca would be a good choice followed by lunch at a restaurant of bar or maybe a picnic by the lake. If you want to spend the afternoon bathing or playing on the beach it is possible to find lots of shade under the trees which encircle the lake. But, why not hop on the ferry over to Isola Maggiore? It only take around thirty minutes and is a delightful ride. If you would like to see more about Isola Maggiore then watch the videos here: there are two. One for children and a second for adults. A series of concerts by remarkable musicians set on the lakeside of Isola Maggiore against a back cloth of glorious sunsets. Set at the Lido di Tuoro, the Parco del Sole and the historical centre of town. Theatre, entertainment, food and games plus the re-enactment of the times back to the Second Punic War. An opportunity to see history come to life . It is held in the theatre of the Palazzo della Corgna. Classical Music Concerts. Passignano is my local town. Just a fifteen minute breathtakingly beautiful drive down from my home in Castel Rigone. I enjoy the beach in the warm summer months and walks in the hills during spring and autumn. It’s wonderful lake with its changing moods is a pleasure at all times of the year and in all weathers! May and September are probably my favourite months before and after the burning heat of summer making walks in the hills a pleasure. The slideshow below will give you a good impression of the town. 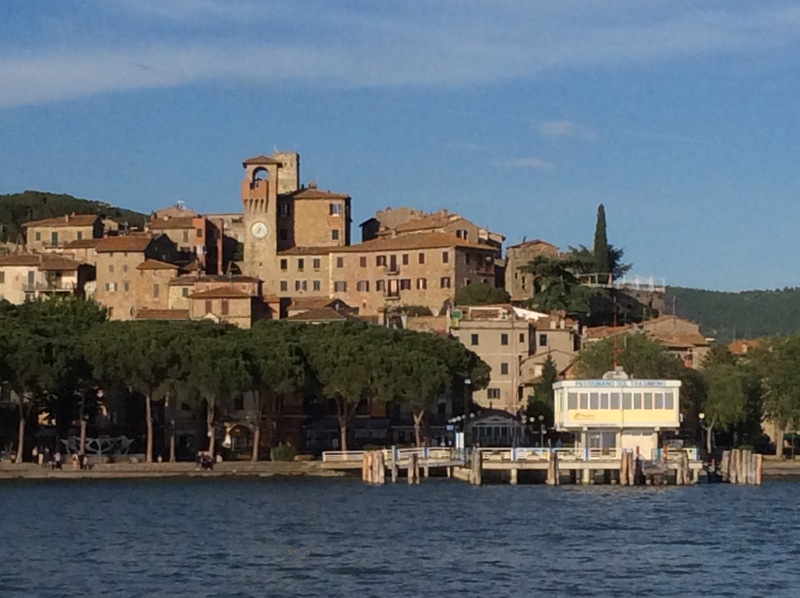 Passignano is a ‘living’ town and, unlike most lakeside towns it doesn’t go to sleep in the Aurumn. It’s many bars, restaurants , shops and facilities remain open because they are primarily required for its residents. 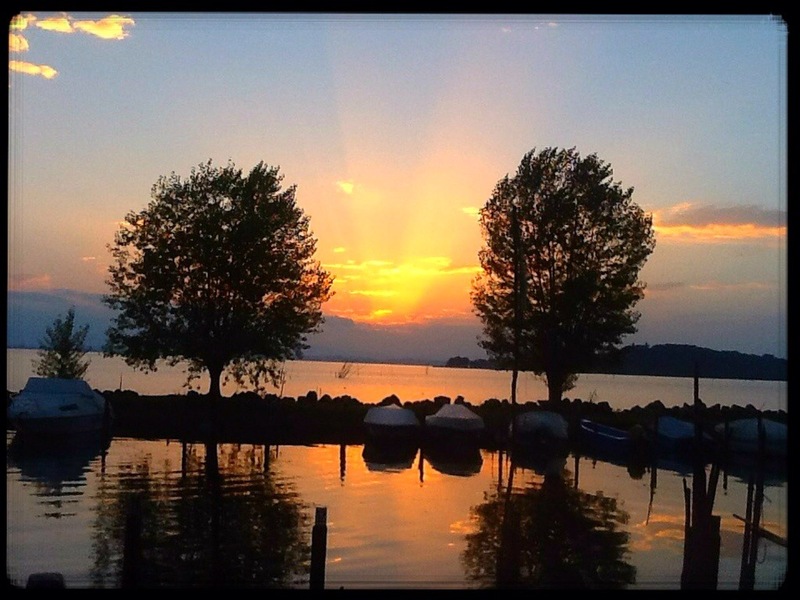 The location on the magnificent Lago Trasimeno is breathtakingly beautiful with amazing sunsets the memory of which will remain with you forever. 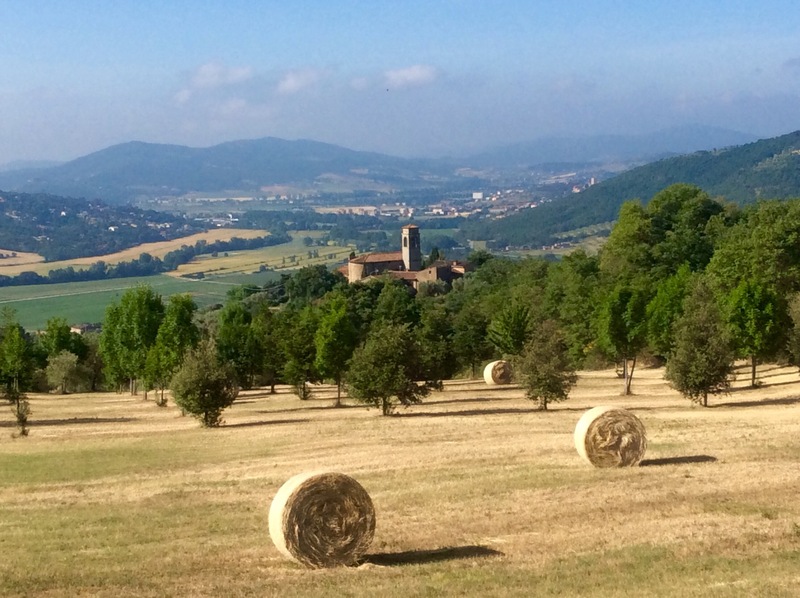 Although I wouid always recommend hiring a car when visiting Umbria, so you can visit the quaint little hilltop villages, Passignano is one of the few places where one can easily travel using local transport. Or simply stay put and enjoy sauntering around the town and relaxing by the lake. The train station is just a five minute walk from the centre and from here you can be in Florence in just over an hour, Perugia in twenty minutes, Rome in under two hours, Sienna, Arezzo …….just to mention a few. Bang in the centre of the town is a ferry terminus with regular boats to the beautiful island of Maggiore from where it is also possible to sail to Castiglione del Lago. 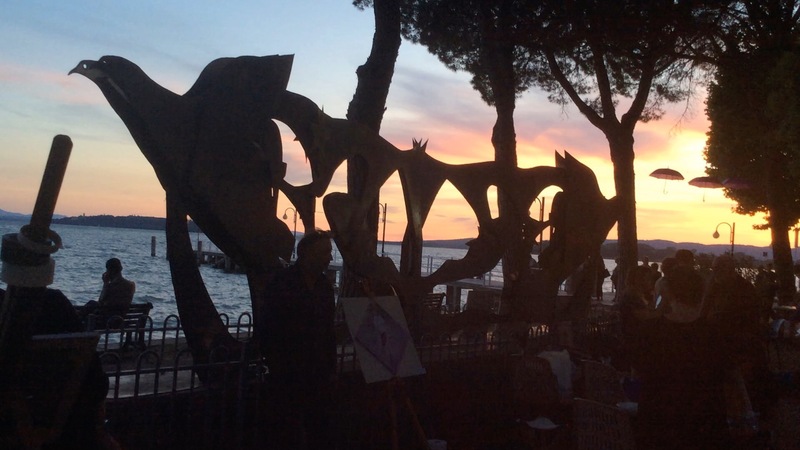 Passignano is a warm and friendly town, never crowded even in the summer months when tourists simply blend in with the local population but on a Saturday and Sunday there is a wonderful atmosphere when the town comes alive with locals and day trippers. There is a weekly Saturday market and a an extensive market with just about everything including antiques, every third weekend which stretches along the lake and through the streets. 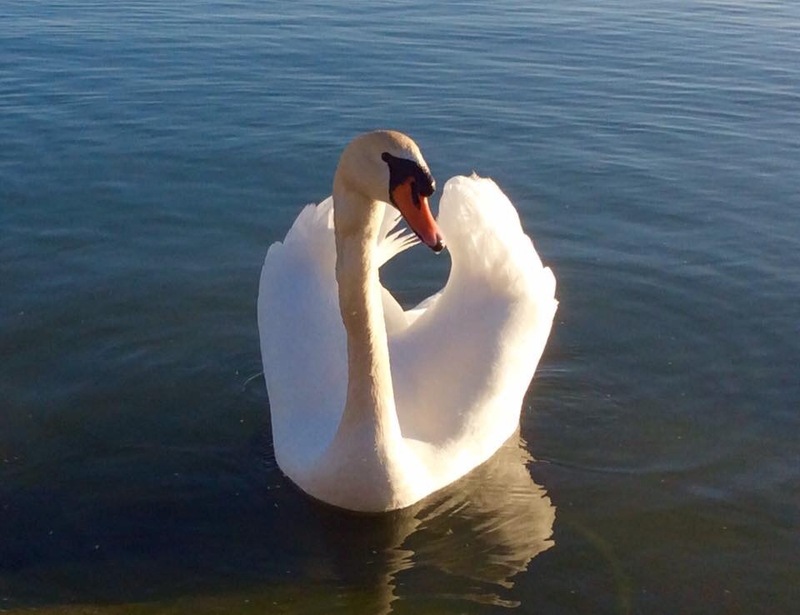 There is a delightful walk along the lakeside, gardens and a playpark for children plus the attraction of our swans! 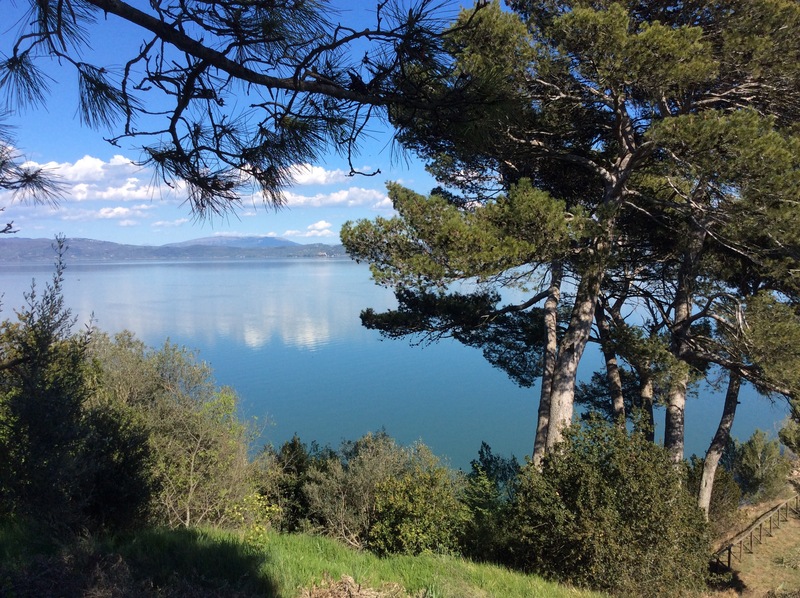 Passignano also has a small and uncommercialised beach – Sualzo Beach – with water sports in addition to volley ball courts and pedalos and there is a great bar catering for drinks and meals and snacks. For those who don’t like bathing in the lake a swimming pool is available at a very moderate charge. Adjacent to the beach is a lovely grassy park to relax or picnic in. Plenty of parking is available. Here is a link to a video for children. It is of a short walk through the olive groves. Also called: PASSIGNANO SOTTO LE STELLE. Passignano under the stars. An all night event although you can, of course choose when to go and to leave! The whole town is pedestrianised and restaurants set out additional tables in the roads. There is music and entertainment, fashion shows, concerts plus a special area for the kids. Booking a table is advised unless you want to wait for hours! It is a great evening ( I haven’t stayed all night!) . Arrive late afternoon unless you are familiar with the town because finding parking later is difficult. This has to be seen to be believed!! The reenactment of the power struggle between two families with a difference! On the Sunday there is a spectacular boat race on the lake and through the narrow streets of the old town. How the teams manage to negotiate the twists and turns carrying these huge boats I don’t know! There is also a wonderful costume procession and in the evening lots of opportunities to feast followed by the burning of the castle (not really!) and fireworks. Not to be missed! Click on this link below for snips from last year. This is a vintage boat race. It is non competitive and open to all boats with paddles. It is the reenactment of an ancient traditional race for fishing boats. The route is from Passignano to Isola Maggiore and Isola Polvese. Then to Monte Del Lago and back to Passignano. The Festival of the big pan! 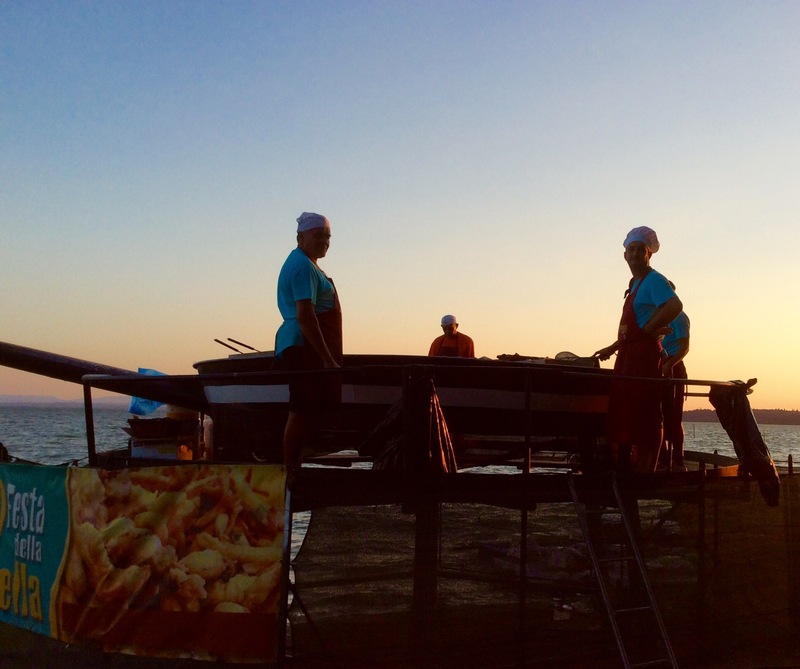 Tables are laid out along the lake and tons of fish are cooked in the big pan. An amazing scene! Perched on top of Monterone in the Central Apennines and nestled in pine-woods, 650 metres above sea level, is the enchanting medieval village of Castel Rigone with magnificent views over Lake Trasimeno. 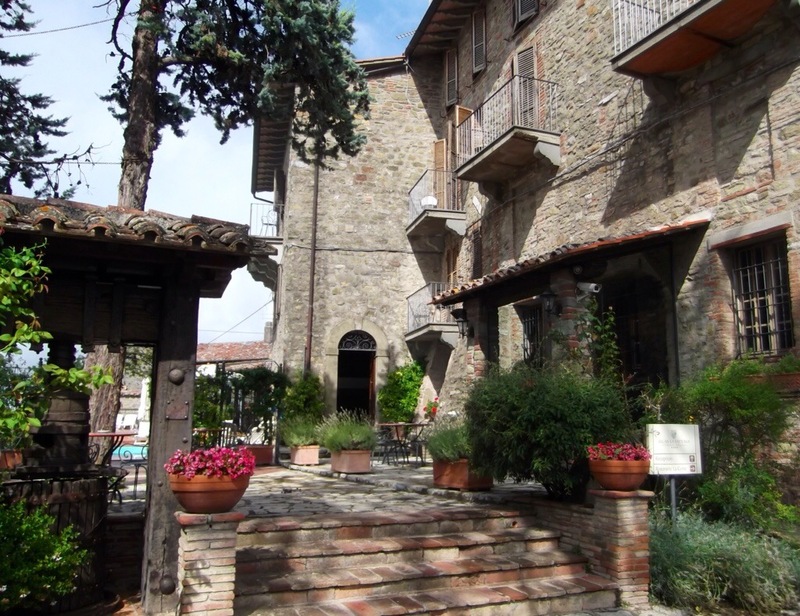 It is located 12 km from Passignano and a 30 minute drive from Perugia airport. According to tradition, the name derives from that of an Ostrogoth commander, Arrigo (or Rigone) who in 543 set up a base here for the siege of Perugia during the Gothic wars. It is a beautiful hamlet with winding roads, charming piazzas and pretty houses decked in flowers. Three of the four towers remain and are now converted into houses. There is an excellent Alimentare (supermarket and local produce shop) which offers home cooked pastries and a selection of hot dishes. a Farmacia (Chemist) a Bibliotecca (library and information centre) Bancomat and two bars with WiFi. There is also a delightful children’s play area and a shady park with seating and tables opposite to the Bibliotecca and a fresh water machine dispensing both aqua naturale and gassata. 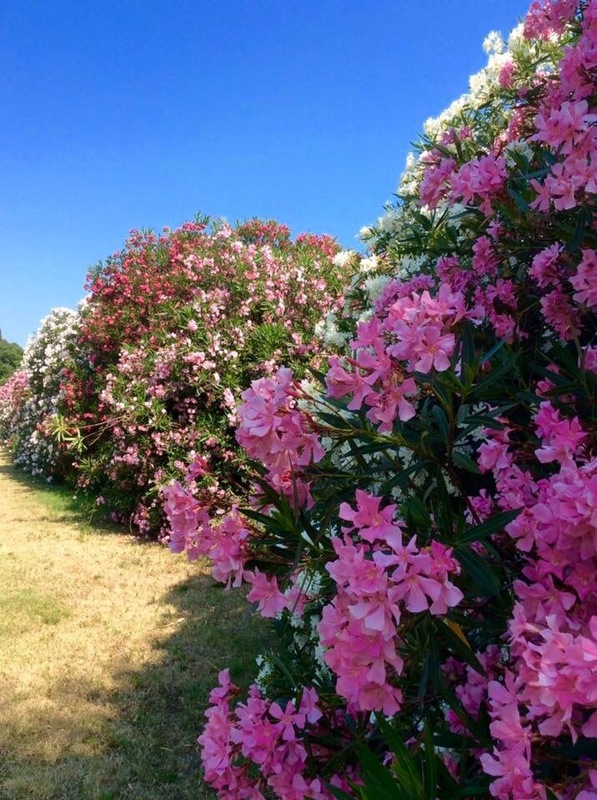 Just a five minute walk from the Farmacia down the Passignano Road is an extensive and beautiful pinewood perfect to escape from the heat, to picnic or to play. Strangely these woods are where I came as a teenager with my parents on my first holiday in Umbria many many years ago. We camped down by the lake and the pinewoods were one of the places we escaped to during scorching hot August afternoons. Sadly they fell into disrepair and were unused and overgrown for years. The restaurant closed. The bar closed. Then a couple of years ago new Life came to the woods and they were reopened together with a welcoming rustic bar serving drinks, snacks and light meals. 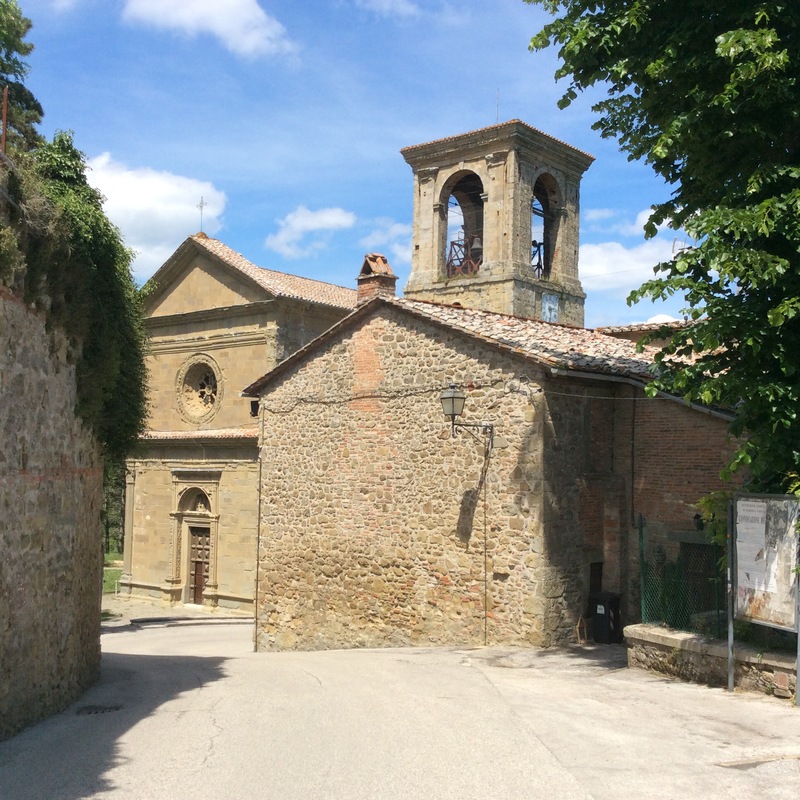 Dominating the village is the late 15th-century Sanctuary, (Madonna del Miracoli), built by a pupil of Bramante. It is an excellent example of Renaissance art and contains a beautiful painting of the Virgin Mary. There is an enchanting story attached to the history othis church. You will find it documented in one of the leaflets available inside. The hotel, Relais la Fattoria was originally a Manor House built on the ruins of the Castle of the Barbarian Arrigo. Later it became a prosperous farm (Fattoria) managed by Aldo Pammelati, father of the current manager, Roberto Pammelati. It is a beautiful and very unusual building with perfect views across the lake. The village is perfect for those who love leisurely walks or long hikes! There are plenty of both. It is also a dream for those who enjoy sketching or photography. It is the perfect base from which to visit so many beautiful towns in the area by car or train. 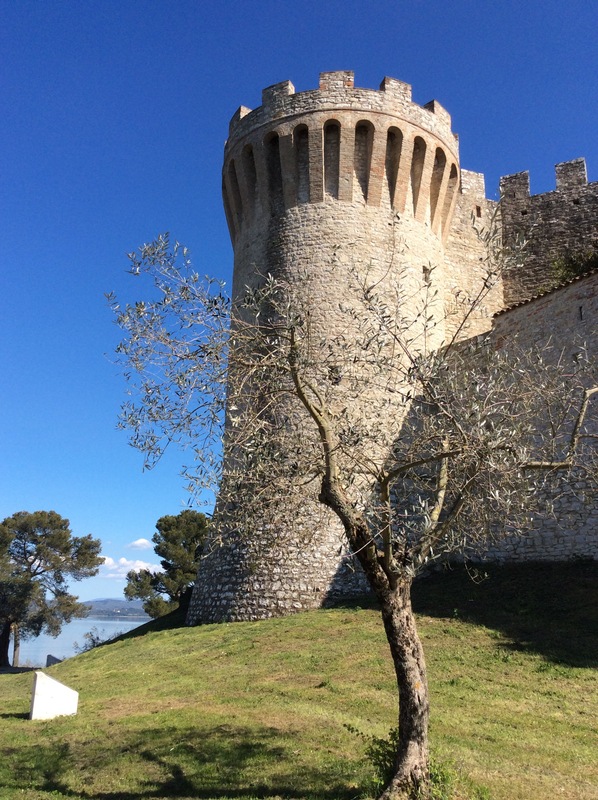 Passignano and Magione are just ten minute drives away down exquisite winding roads. Castiglione is a drive of thirty minutes. Corciano, Assisi, Umbertide and Spello are drives under the hour. Rome and Florence can be reached by train from nearby stations in under two hours. Festa dei Barbari 2nd -5th August. A date and place that should definitely go down In your diary. Festa dei Barbari. The Barbarian Festival. This is when Castel Rigone relives and celebrates the time when the Ostrogoths made their base here. 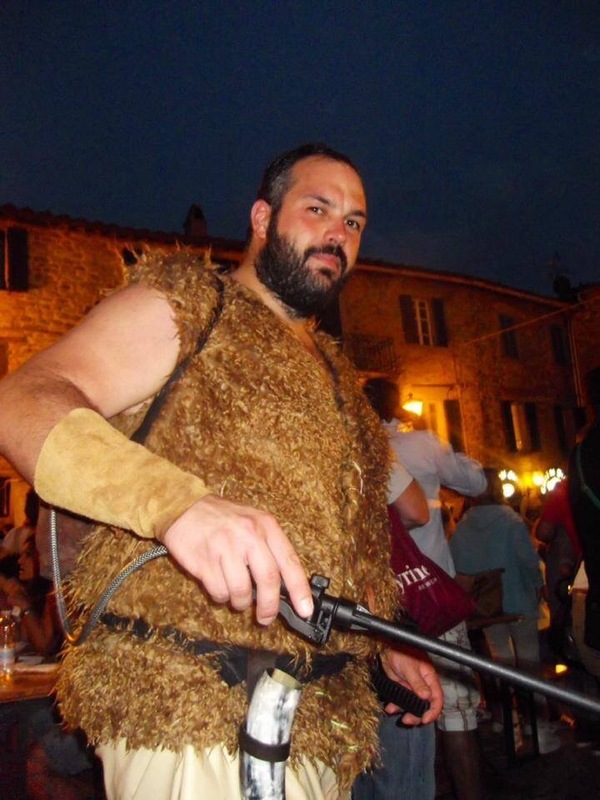 For four nights and days the hamlet relives this time with nightly entertainment and feasting in the main piazza, jousting, music, handicraft displays and a market. Onthe last day, Sunday the whole village takes part in an amazing costume parade culminating in a Palio which is different every year. This really is one of the best festivals in Italy, there is something to interest everyone, no matter the age. The food is great. The wine flows free and is included in the price and the location is perfect. Follow the link below to watch an excerpt from one of the festivals. The Barbarian Festival. Castel Rigone. Every summer Classical concerts are held in the romantic little Piazza San Francesco. Piazza San Francesco has perfect acoustics and attend a concert here is an unforgettable experience. This festival features eleven concerts performed by young musicians in a variety of combinations. For more information : http://www.giovaniconcertisti.com. Considering it’s location, San Feliciano is a very unassuming town which goes about its daily routine seemingly unaware of its popularity. 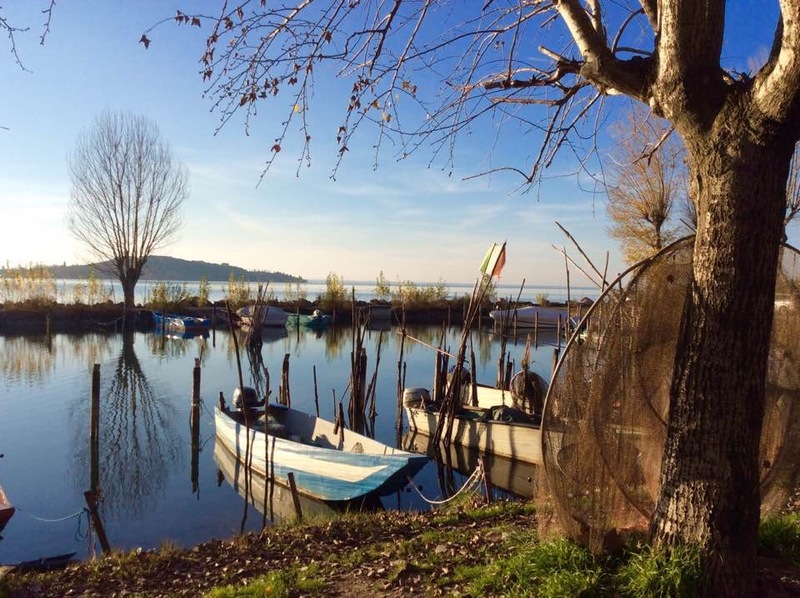 A charming fishing town on the shores of Lake Trasimeno situated between Passignano and Magione and adjacent to Monte Del Lago, San Feliciano, is well resourced with shops, bars and restaurants and a playground for children. The drive from to San Feliciano from either Castiglione or Passignano or Magione is really, really beautiful. 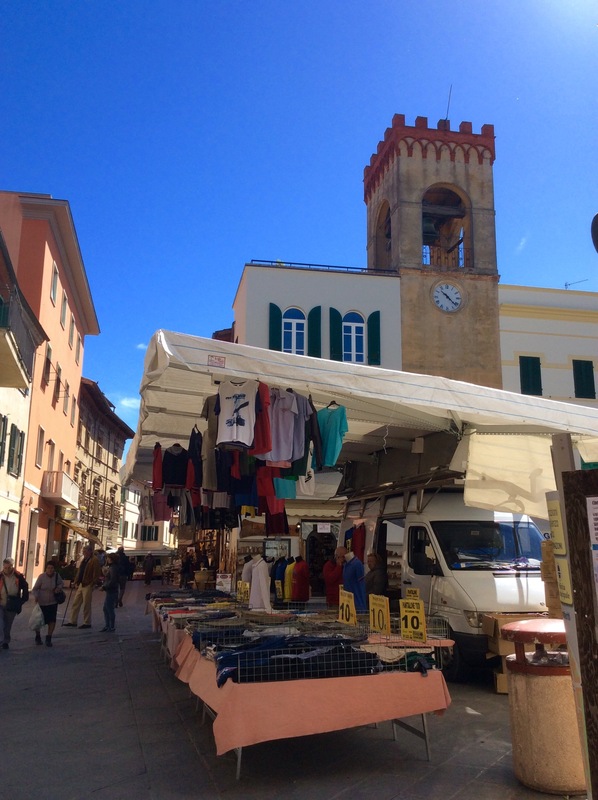 There is a Saturday morning market, a fishing museum and a ferry to the beautiful nature reserve of Isola Polvese. I love to go there early morning to watch the fishermen bringing in their catch and to observe the, very well fed cats, waiting for their breakfast! It is also a perfect location to observe magical sunsets over the lake. There are many quiet beaches within easy reach of the town and some lovely walks and cycle routes. The lakeside is the obvious attraction but it is definitely worth exploring the small streets of the town where you will find quaint little houses adorned with window boxes of red geraniums. From the town you can walk up into the hills from where there are great views of the lake. This is the largest of the three islands in the lake and is anature reserve belonging to the Province of Perugia and used for environmental and research activities. From Spring to Autumn there are ferries from San Feliciano. It is a very short trip. About ten minutes. It is a wonderful place to walk and relax and bathe. There is a small beach just five minutes walk from the jetty (turn right to get there) and lots of open places for kids to run around and play. The island is home to lots of water birds and very noisy frogs although it’s unlikely you will spot any of them. They are too quick to spot you! 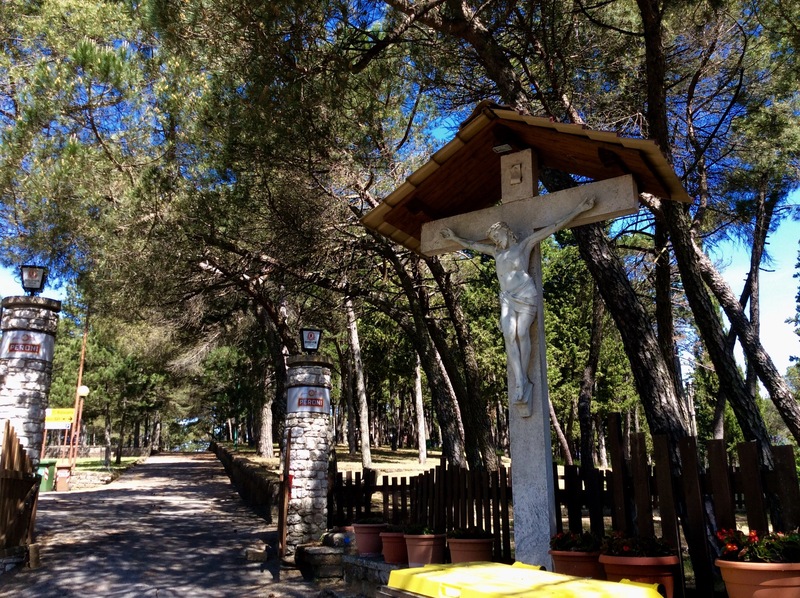 Walking round the lower part of the island near to the lake is shaded but the higher level with magnificent views of the lake and the Olivetano Monastery, is quite exposed so better to explore early or later in the day during summer. The castle (lower level) is very impressive and in the spring very popular with nesting birds! 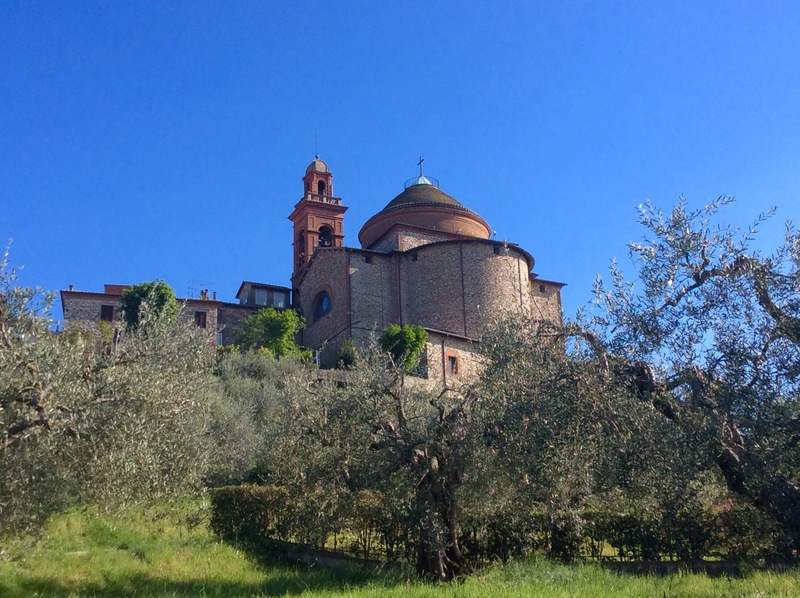 Adjacent to the castle is the very pretty church of San Giuliano. There is a bar attached to the hotel near to the ferry serving drinks and snacks and near to the beach there are toilet facilities and another bar. On the higher level you will find a second hotel and restaurant. The island sports a wealth of trees and plants and in the late spring it glows bright pink with hundreds of Rhododendron blooms. A picture postcard little borgo with amazing views of the lake and steps done to a lovely walk along the lake. In the spring i go there to enjoy the flowers and birdsong. During late summer to pick and eat the delicious wild figs from the trees lining the walk. Yesterday I encountered only one of its 1.000 inhabitants, a lovely old lady who explained some of the history to me. The name is derived from Fundus Munianus, dating back to the Roman times whe the family Munius lived there. The Abbey was founded in the 10th Century by Benedictine Monks and taken over in the 14th century by the Cavalieri di Malta who still own land in this area plus the castle in Magione. The fortified walls of the town date back to this period when they protected the farmers who lived and worked there. Although unassuming at first sight on exploring the tiny squares and streets one encounters a surreal atmosphere where history meets art. For many years both Italian and foreign artists have created a permanent exhibition of frescoes within the walks of this ancient village. These ‘Muri Dipinti’ peep out round every corner, from under washing lines and arches and their originality, themes and styles breathe a multitude of different languages and cultures giving Mugnano a unique charm. The idea for this artistic came after the castle was reconstructed in 1983. The exhibition is lit from sunset making it the perfect place for an evening stroll to appreciate a very unusual but successful marriage of historical buildings and modern art. A picturesque town with an amazing landscape. The place that inspired the artist Perugino and many of his remarkable paintings and frescoes can be viewed in the town’s churches and museums. The centre boasts some beautiful and majestic buildings including neoclassical and renaissance styles. Children will love exploring the rabbit-Warren of twisty, tiny backstreets with their archways and quaint houses. They will also love the PALIO DEI TERZIERI on the 8-19th August 2018. The last day, Sunday is the best when there is a very long and amazing costume parade with music, flag throwing, oxen and even canons firing footballs! At the end there is a re-enactment of the ‘ Bull Hunt’ a kind of archery display. Be sure to stay on and eat In one of the family tavernas. Book before the parade to be sure of a table. Keep popping back to this page as more will be added.